Matrix / Runout (Etched in runout, Side A): MS6A SUNSHINE N.Y.C. Matrix / Runout (Etched in runout, Side B): MS6B SUNSHINE N.Y.C. As value for money 12"s go this was £5.50 very well spent at Eastern Bloc back in the day. The fact I had to stand at the counter trying to sing the acid line to bemused looks from the staff until they reached down and pulled out a sealed copy from under the counter...... was totally worth it. All three tracks are classics in their own right. I agree with with all the positive comments above.Imagine if Virgin had all they needed for their first Techno L.P,this masterpiece might not exist.This represents all the magic of Techno.Big crunchy beats with the savage Detroit hi-hats,combined with those gorgeous heavenly synths.They are so beautiful and ethereal in their magical swirls and patterns,that do something so special to me whenever I hear it.Not just my fave Techno tune,but fave Dance track ever.I once met Mr May at the Hacienda in the very early 90,s.I told him that I loved his music and it had had a profound effect upon my life.He hugged me,blessed me and took the record he had just mixed out of, and rubbed it on my head.A strange but lovely gesture from the king of heartbreaking Techno. 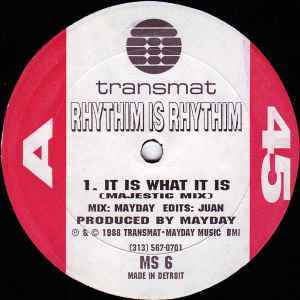 "It Is What It Is" was written in a single night, when Virgin found that they didn't have enough quality tracks for their "Techno - The new Dance Sound Of Detroit" album. It was subsequently released later in 1988 as a single.